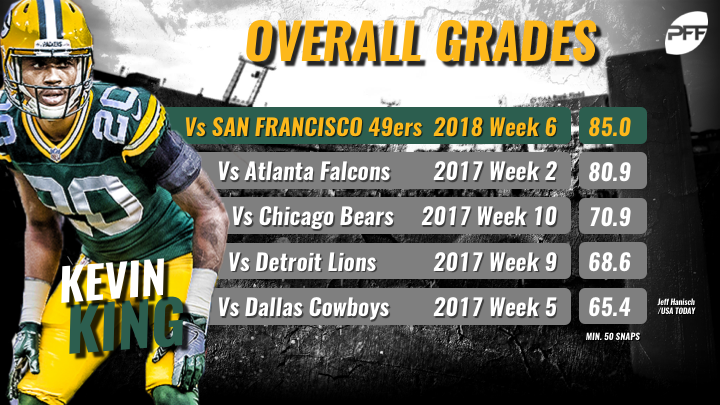 Before Monday Night, Kevin King had played 324 coverage snaps across 12 games for the Green Bay Packers. He had not received an elite single game coverage grade above 90.0, and he had not recorded an interception. That changed with 1:13 left in the fourth quarter when King intercepted San Francisco 49ers quarterback C.J. Beathard and put the ball back in the hands of Aaron Rodgers for the game-winning drive. King was matched up in the slot with the known speedster and former Olympic long jumper Marquise Goodwin, who had already burned King’s teammates for touchdowns on multiple occasions. There was no safety over the top to help him, but it didn’t matter. King turned and ran with Goodwin stride for stride, keeping him on his outside shoulder before turning his head and securing the interception through contact by Goodwin. It was the biggest play of King’s young career, and it was a fitting ending to an impressive night for the second-year cornerback out of Washington. On a night in which Beathard passed for 245 yards and two touchdowns, King was targeted four times and allowed just one catch for 17 yards. Last night, Beathard’s passer rating when targeting King was only 5.2. Though the interception was the headliner, it wasn’t the only impressive play that King delivered in coverage. On a 2nd and 9 in the second quarter, King was matched up in press coverage with Pierre Garcon in the slot. He didn’t allow Garcon to release cleanly and blanketed him throughout the slant route. The ball from Beathard was thrown too far in front of Garcon, but had it been on target, King was in prime position to break up the pass. On another play with the 49ers driving late in the first half, King’s strong effort in coverage was wiped out by a holding call on Josh Jackson away from the ball. Beathard rolled to his right to avoid pressure up the middle before firing to Goodwin on a comeback route. King was once again in a strong position on the route, right on the hip of his man. His close coverage helped to force what would have been the fourth incompletion in his coverage. There was a play or two where King was beaten, such as a comeback by Goodwin on the first drive of the game where he was playing the go route, which is understandable given his speed. All in all, though, it was an impressive performance by King in coverage. His coverage grade of 69.0 now ranks t-27th on the season among 85 cornerbacks with at least 200 defensive snaps. If last night is any indication, that grade will be on the rise as the former standout Washington Huskies corner settles into the NFL in his second season.